Hello Everyone! 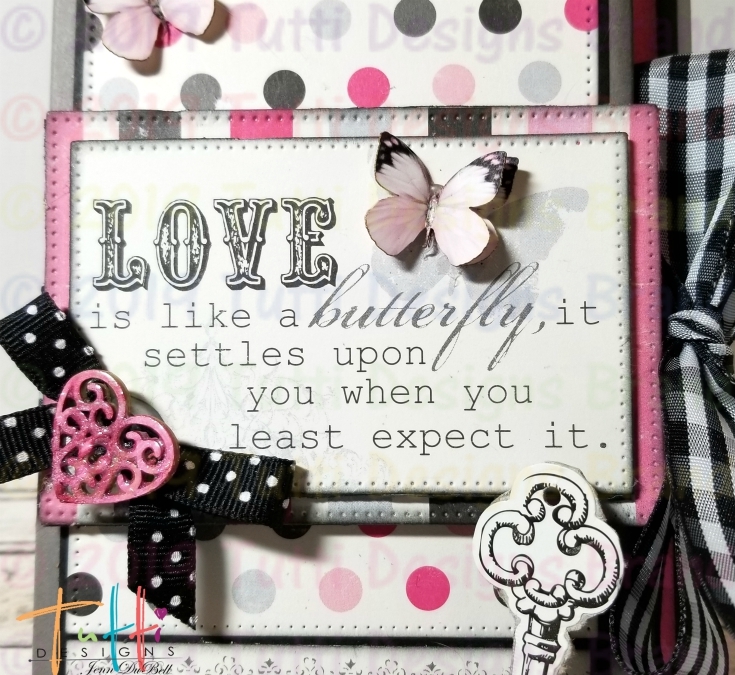 Jenn here sharing my fun folio Valentine's Day Card I created using the amazing Tutti Designs Dies! 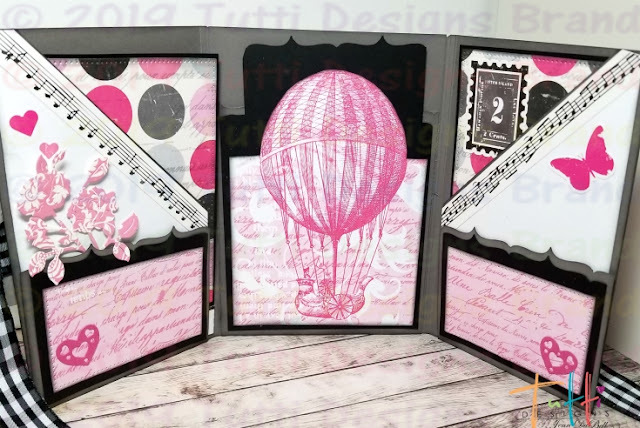 The base of my folio was created following an easy video tutorial from YouTube. 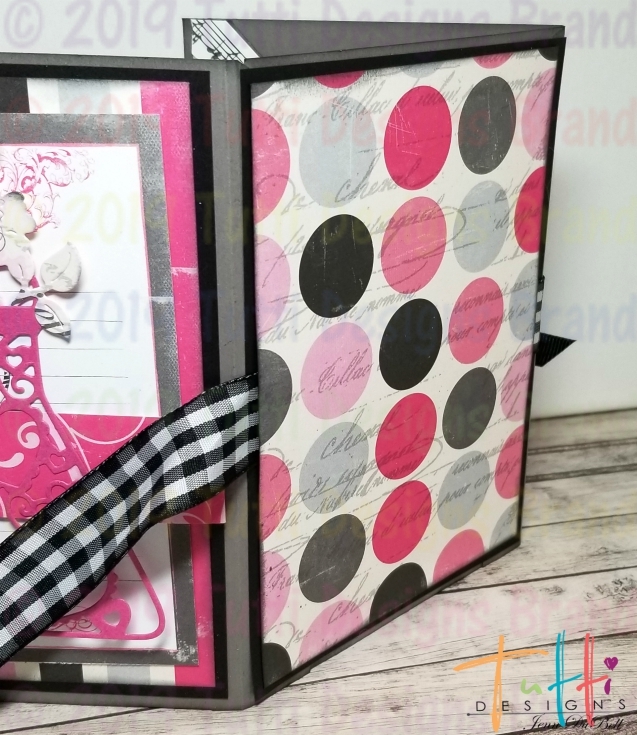 Once the base was created, I matted pages with black cardstock and then designer papers. 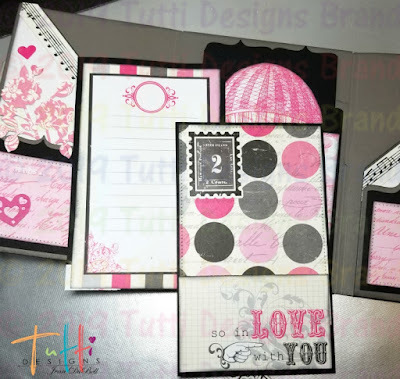 All designer papers were inked on the edges with Distress Ink in black. Using the Dotted Nesting Rectangles largest die, cut a total of three from the designer papers. two are used to create journaling cards for the inside as seen below. You can embellish any way you like. These are slipped into the angled side pockets as seen below. 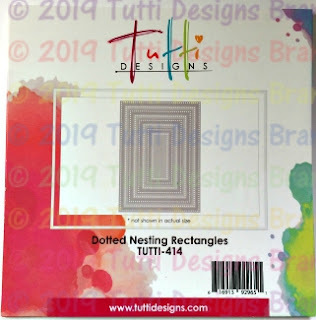 Cut two of the 3.125" x 1.875" Dotted Nesting Rectangles using designer paper, ink the edges and adhere to the smaller inside pockets. The middle (balloon) was fussy cut from the paper to fit over the middle pocket. 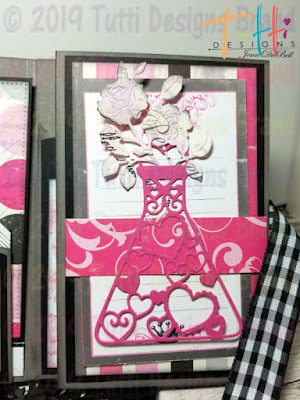 Cut two of the bouquets from the Envelope and Bouquet Die set and one of the Heart Potion. 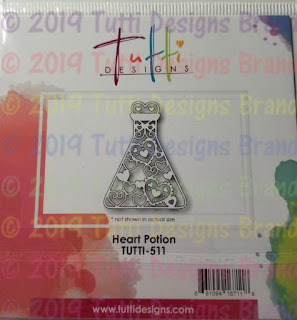 For the inside flap, I added a band and then topped it with the Heart Potion Die cut and added one of the Bouquet dies. 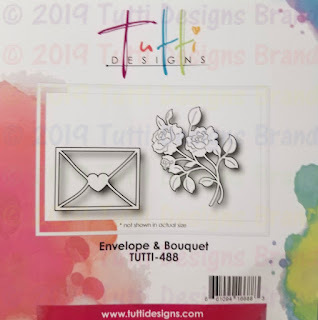 The other Bouquet Die is tucked in the small inside pocket. 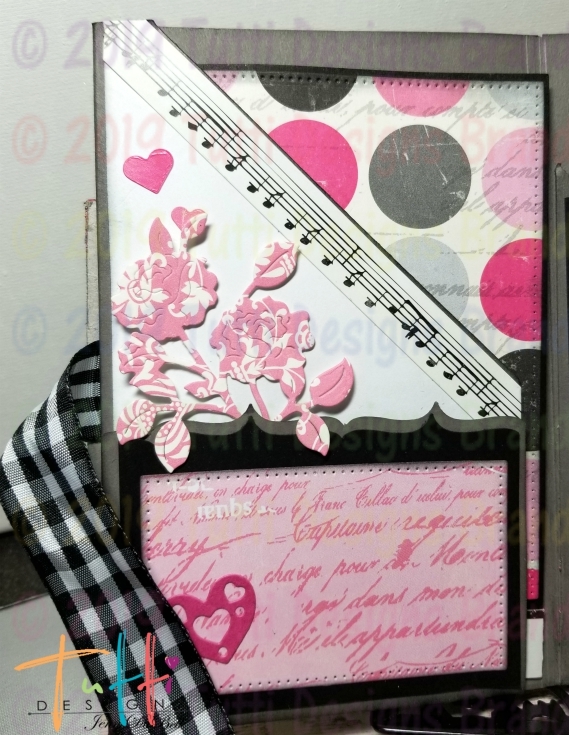 For the front I adhered the third large Dotted Nesting Rectangle die cut to the black mat. 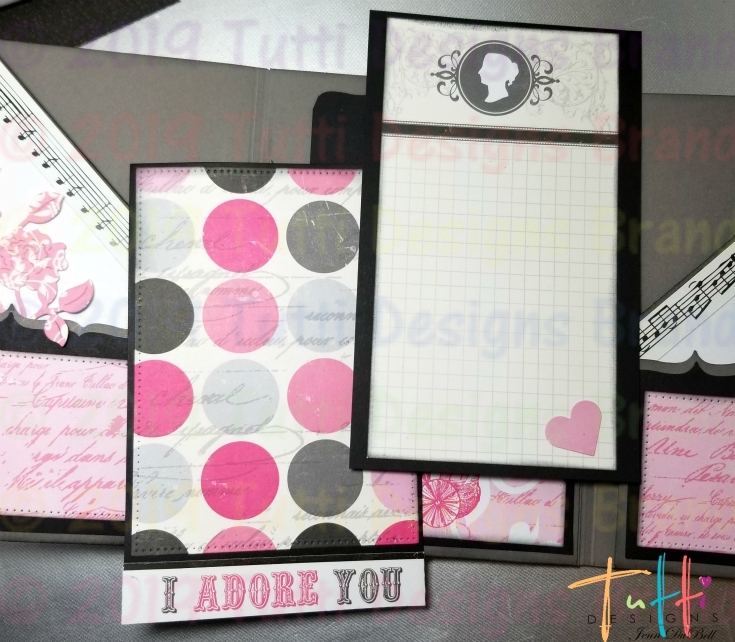 I cut one Dotted Rectangle in the 3.875" x 2.625" size from designer paper, inked edges and adhered to a thick chipboard. Then I cut a sentiment card from the papers using the 3.50" x 2.25" size, inked the edges and adhered it to a thick piece of chipboard as well. I adhered the two together. Using a 3/4" black and white gingham ribbon I wrapped around from the back and tied to place it. Then the back portion was adhered and a piece of designer paper (cut to fit) was adhered over it securing it in place. Next bring the ribbon around to the front and adhere the two layered chipboard over it as shown. 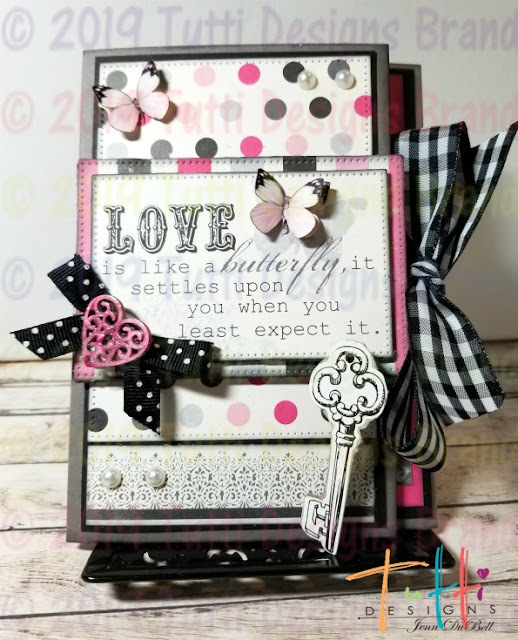 I added another small bow, some butterflies, and a fun heart chippie!